This post is sponsored by Moink, an ethically-sourced meat delivery service. However, my fiance and I have learned something interesting about the star ingredient in our favorite meal, the beef: the type of beef we use - grass fed versus grain fed - makes a HUGE difference! Unfortunately, I found this out the hard way due to digestive issues I would experience after eating grain-fed beef. A friend suggested trying grass-fed beef instead and wow it made a world of a difference! Not only does grass-fed beef digest better, it has way more vitamins and is packed-full of those omega-3 healthy fats compared to its grain-fed alternative. Plus, buying grass-fed beef is actually even better for the environment and supports more humane practices of raising cows. You can read more about that here, if you’re interested! 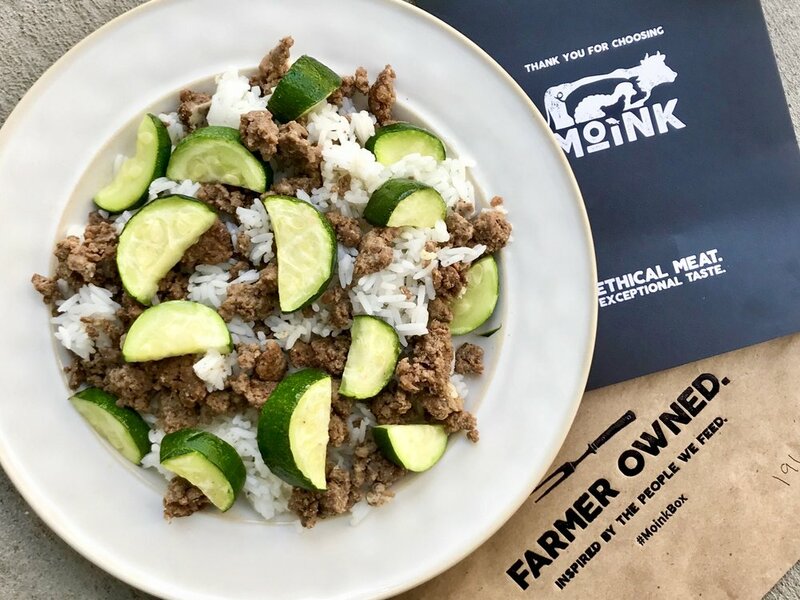 That’s one of the many reasons I love using Moink - all of their meats are ethically sourced and humanely raised, including their grass-fed beef. Plus, it’s delivered right to your door! Basically, this service is for any tender-hearted carnivores that like convenience. Moink has been kind enough to offer you all $20 off your first Moink box order with code “RUNANDLIFT”! Plus, you always get free shipping - it’s a steal. If you want to know more about Moink, you can read the full review of my experience with the company or you can visit their website. Now, let’s get to that easy, peasy recipe! Again, this is a simple recipe, but that’s the beauty of it - you can use it in so many ways & combinations. For example: with jasmine rice & zucchini (favorite! ), as the beef in your spaghetti sauce, or even in a yummy sub sandwich with cheese! After cooked through, drain the excess liquid fat or take out the meat with the spatula without the liquid fat. *Be sure to not drain the fat into your sink, as it can potentially clog! Your beef is now ready to serve! I love it paired with roasted zucchini (slice then broil on an aluminum foil-lined baking sheet for about 5 minutes) and jasmine rice (I use the frozen kind from Trader Joe’s, so it simply takes 3 minutes to microwave).